Money can’t buy happiness, but it can buy waffles - and that’s somewhat the same thing! Being a waffle enthusiast, we began our quest for unique and distinct waffles that are present all around us, yet remain undiscovered. This pursuit took us all the way to Rohini where we finally saw ourselves standing in front of a kiosk going by the name of Maka Maka. Nestled in the heart of Metro Walk mall, Rohini, this place is slowly gaining the attention of all the waffle lovers and also those who have an incorrigible sweet tooth. Situated right at the entrance, the whiff of freshly made waffles will lure you straight to the place. Hygiene being their utmost priority, they ensured that the waffles were prepared in a sanitized environment. We loved the fact that the batter of the waffles was prepared right in front of us vouching for the freshness of every waffle that was being served to its patrons. We love Nutella, we love waffles and hence this became our obvious first order! The batter was poured into a unique mould heated from both the sides. 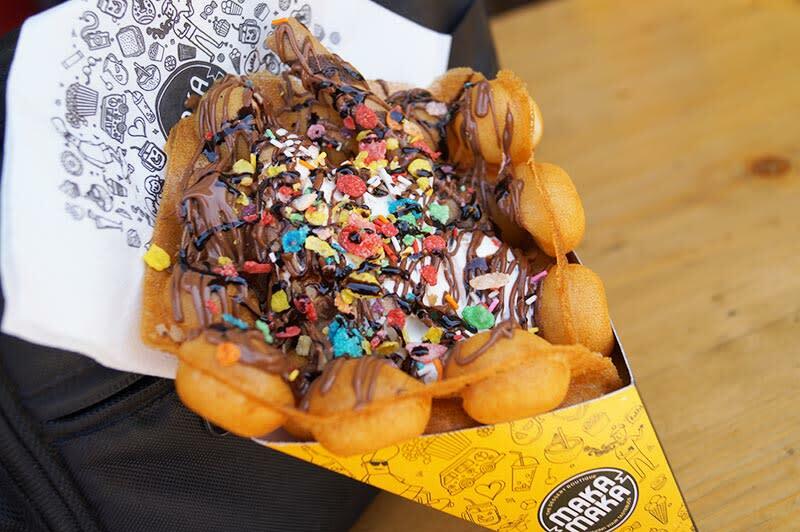 The bubble waffle that came out was quickly given the shape of the cone and finally garnished with two dollops of vanilla ice-cream, oodles of Nutella and crushed munchini. 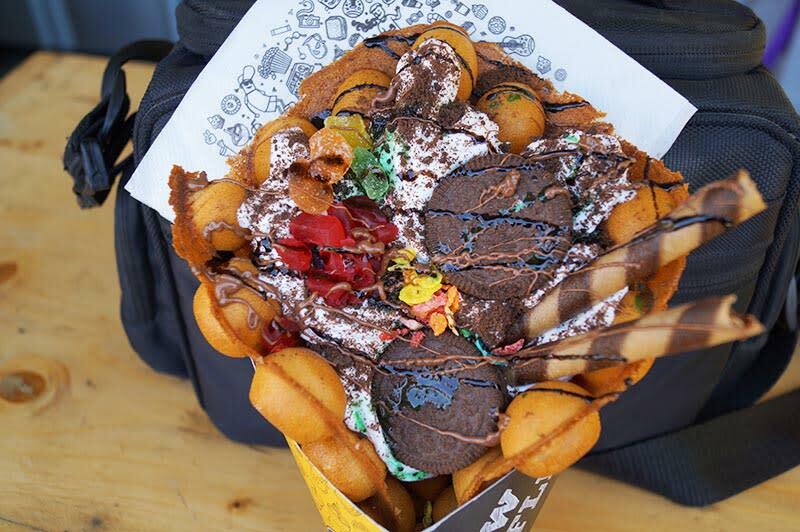 The waffle had a very nice crisp on the outside with perfect mushiness on the inside and owing to its astounding toppings, a chocolate-y flavour along with sweet crunchiness was what we felt while devouring it! While browsing their menu, we found this item to be worth giving a shot. 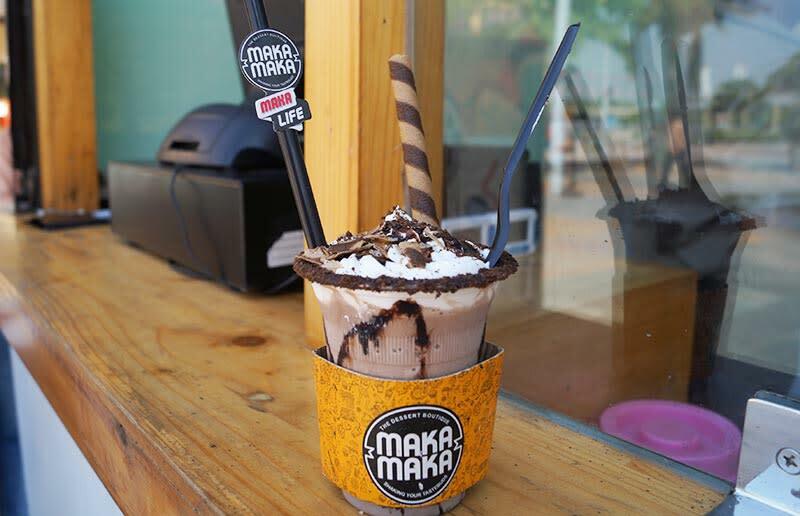 The words freak shake are misleading as we were served with 250ml of cold coffee with whipped cream on top garnished with a biscuit and crushed sugar. The mocha flavour in the coffee was right on its mark but its combo with whipped cream and crushed sugar made the drink a tad sweet impairing slightly the overall taste of the shake. Our faith in this outlet was restored post this particular variant. The bubble waffle was again cooked to perfection with the flawless crispiness outside and apt moistness inside. The toppings in this variant comprised two dollops of vanilla ice cream and toffee and further garnished with Oreo biscuits and chocolate munchini with Oreo shavings sprinkled over it. Though it gets a tad messy to eat, but the happiness achieved by the taste buds is worth the mess! The next variant was this one which had various flavours of jelly along with chocolate munchini as the topping with whipped cream instead of vanilla ice-cream on the bubble waffle. 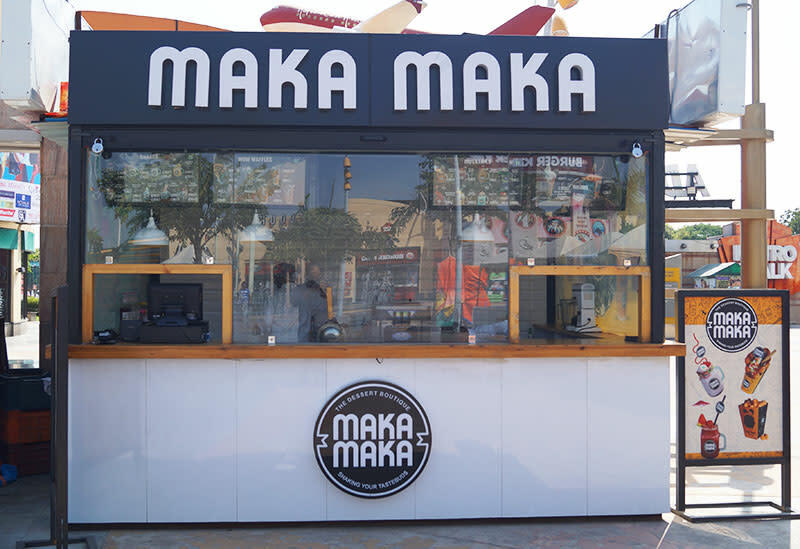 We were amazed how every time the quality of the waffle was maintained and ensured the same taste - good job Maka Maka! The whipped cream tasted good with the jelly but we were more inclined towards the use of vanilla ice cream instead. The jelly waffles did not that ‘wow’ to us! Chocolate syrup, toned milk, crushed munchini, a dash of sugar syrup and crushed milk chocolate when blended together results in this masterpiece. 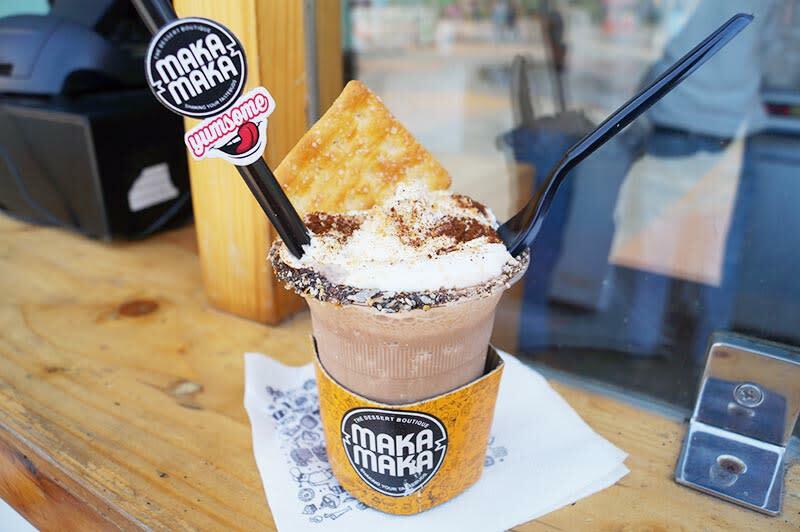 The tumbler wall was decorated with chocolate syrup and the drink was garnished with whipped cream having dark chocolate shavings sprinkled over it with the brim of the tumbler having a coating of crushed munchini. Calling this a freak shake would be an understatement, yet for all the chocolate lovers, missing out on this item would not be less than a sin! All in all, the place is a one-time visit and the curiosity is all because of the bubble waffles! The taste of the waffles is worth splurging on, though we have a different opinion for their shakes. 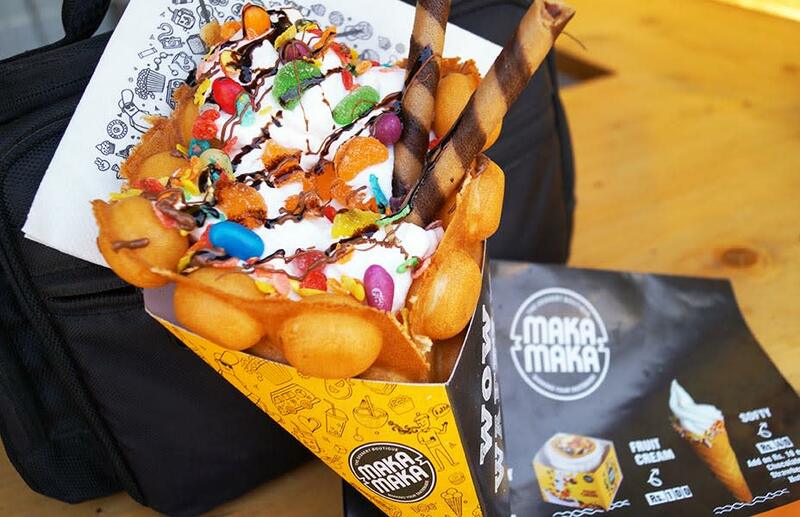 We were amazed by the presentation of the waffles in the form of a cone with ample scrumptious toppings inside. Happy munching!